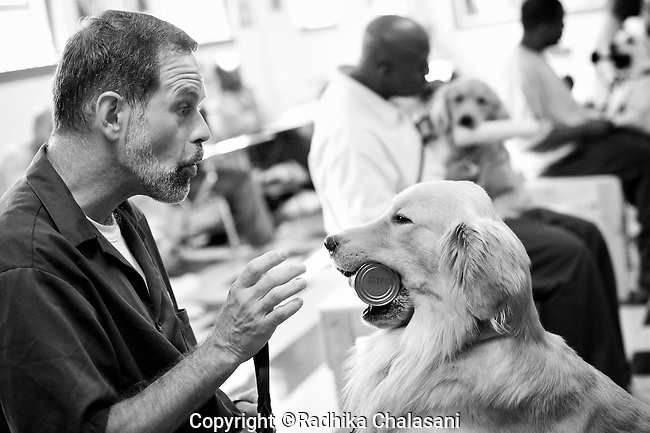 BEACON, NEW YORK: Ed instructs Midas to hold and a can during their once-a-week class for the Puppies Behind Bars Program at Fishkill Correctional Facility. Ed has been in prison for 16 years and is serving 20 years to life. He's been in the program since 2003. The puppies live with the prisoners full-time and accompany them wherever they go on the prison grounds while they are trained to be service dogs.